Send automatic notifications based on trigger. Create series of web push notifications. 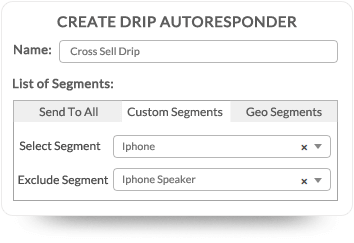 You can create different drip campaigns for different segments. Create series of web push notifications under each drip. You can make a Cross-Sell campaign, where you can send series of different products to user based on their purchase behavior. 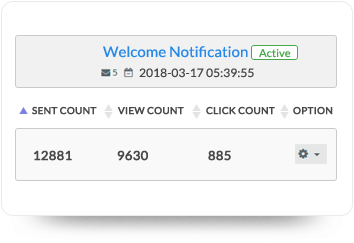 Drip Browser Push Notifications are sent to your users based on site action – like subscription to notification or adding to favorite list. Hence this leads to higher click rates as these are contextual. 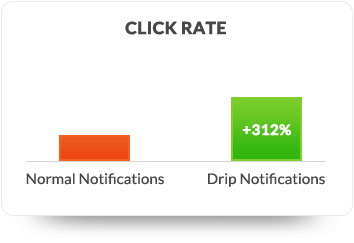 With Drip you can nurture your leads to convert, and increase conversion rate.Intex Case Study shows an increase of 312% on CTR with Drip Push Notifications. Check the detailed analytics and see how each stage of the auto-responder is performing. 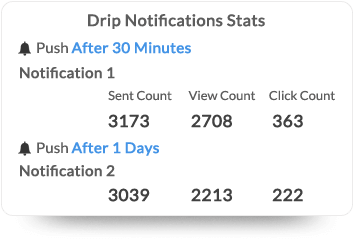 Analytics offer in-depth data related to your drip campaign. You can check the overall performance of each message and at aggregate. Design your drip campaign in less than 10 minutes and go live. No need to add any separate code to run drip. Just create a drip campaign from our application and launch.